It was an exciting week for Northwestern baseball and softball, as the teams hosted 10 games. Softball split against Illinois and took two of three from Ohio State, while baseball won mid-week clashes with Milwaukee and UIC before getting swept by the Buckeyes. Michael Stern covers the bases, and there were plenty. 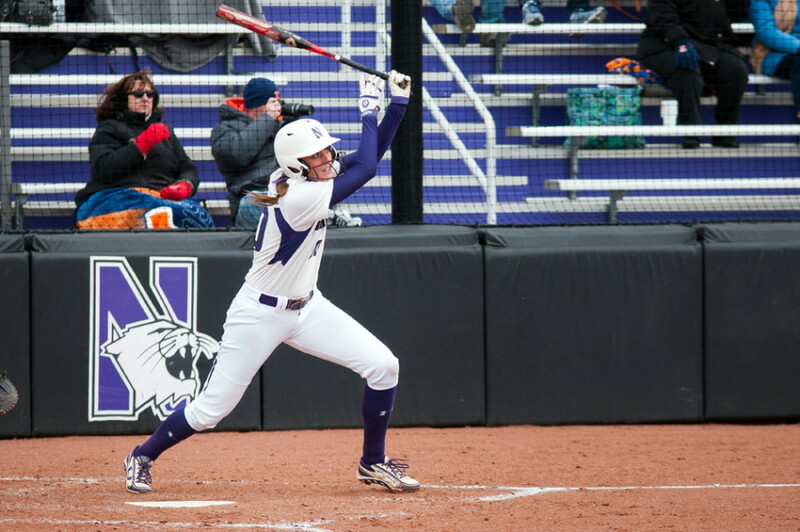 Andrea Filler delivered 12 RBI in five games this week for Northwestern softball. The Wildcats’ RBI leader was the Big Ten’s player of the week. Photo credit: Nathan Richards, Daily Northwestern. After a strong 3-2 homestand against conference contenders Illinois and Ohio State, Northwestern sits in fifth place at 12-7, half-a-game behind 13-7 Illinois (remember the cancelled game against Wisconsin earlier in the season? That accounts for the one game difference between the Wildcats and the Illini). Northwestern travels to 12th-place Iowa for three games this weekend, while Illinois faces third-place Nebraska. If the Wildcats finish the weekend with one fewer loss than Illinois, NU should clinch the fourth seed and a first-round bye in the Big Ten tournament. The second game of the Wildcats’ series against Ohio State lasted two days and featured seven homers. Northwestern committed six errors and lost 20-17, in a game which was suspended Saturday in the bottom of the second inning with NU ahead 4-3. Ohio State led 8-4 after three innings and 10-9 after four, but the Wildcats rallied to take a 14-12 lead after five. The Buckeyes battled back and held a 16-15 lead after six, and used a four-run seventh to pull away. Andrea Filler led the Northwestern offense with five RBI and her 11th homer of the season, while Olivia Duehr’s seventh longball of the season landed on the roof of Welsh-Ryan, the third time a Duehr big fly has granted her membership to the roof club. Errors also hurt Northwestern in their other loss this week, as the team committed four errors in a 9-8 loss to Illinois. Filler helped the Wildcats in their other victories, finishing the week with 12 RBI, good for Big Ten player of the week honors. The shortstop leads NU with 56 RBI, 16 more than any other Wildcat. Northwestern’s pitching staff has a 5.39 season ERA, but the first week of home games at Rocky Miller Park was a strong week for the Wildcat bullpen. Tommy Bordignon pitched four scoreless innings (two against Milwaukee and two in game two against Ohio State), Pete Hofman threw three scoreless frames against UIC, and Joe Hoscheit pitched a scoreless eighth against the Flames to earn his second career win (both against UIC). The week’s most impressive reliever was Joe Schindler, who threw 5.2 innings in the home opener against Milwaukee, earning his second victory of the season. The sophomore from Eugene followed that up with 2.2 scoreless innings in game one against the Buckeyes. Starter Reed Mason also delivered a bounceback start in the second game of Sunday’s doubleheader, throwing 8.2 innings and allowing one earned run, lowering his ERA to 5.28. A couple Northwestern baseball players who had seen limited playing time entering the week took advantage of opportunities in the starting lineup. Freshman catcher Jack Claeys got the start against UIC and went two-for-four with two RBI. Jack Mitchell (yes, that Jack Mitchell) has only 55 at-bats on the season, but he delivered a homer in the Milwaukee game. RJ Watters got his first two starts of the season in Sunday’s double-header against Ohio State, and Watters went three-for-seven with an RBI. Previous Does Trevor Siemian have a chance of making an NFL team?